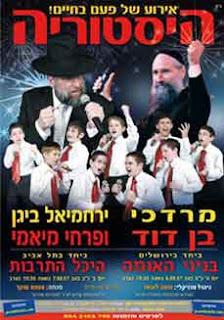 Mordechai Ben David (M.B.D) and Miami Boy' S Choir (M.B.C) will be at Binyané Haouma accompanied by the orchestra of Moshé Laufer, is on august 5th . and in Tel-Aviv, in Heih' Al Hatarbut, the following day, august 6th . What is the telephone number to get tickets? It is not clear on this poster. Thank you. What is the telephone number or where can you get tickets for this concert? Are there any other concerts in Israel at this time? Rumor has it Ari Goldwag will be singing at the concert too.